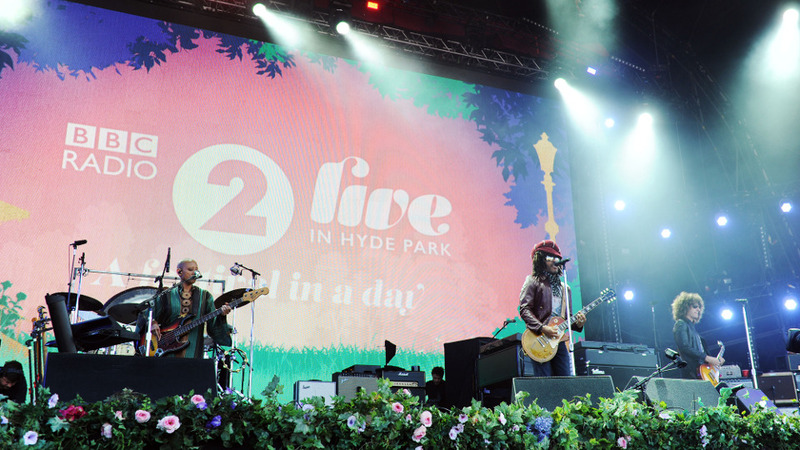 BBC Radio 2 Live in Hyde Park returned for another year yesterday as 60,000 people enjoyed performances from some of the biggest stars in the world of music. 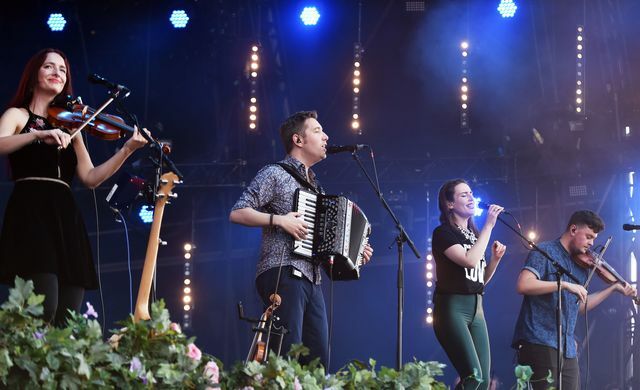 With it’s usual wide range of acts and genres that are a staple of Radio 2’s playlist, the line up this year was an eclectic mix of rock, folk, country and pop. The sun was peaking through the clouds and the crowd was packed in and ready for a day of fine music. First to take the stage was rocker Lenny Kravitz who oozed cool in flared jeans, aviator shades and a woolen hat covering his dreads. He got things started with a bang as he strummed his guitar to play the opening notes of his 1999 no.1 hit Fly Away. The energy was electric as thousands of revelers followed Lenny’s every request, clapping and singing along on demand. With American Woman continuing the theme, the crowd were well and truly warmed up and in fine voice. Lenny’s musicianship and that of his fantastic band, were clearly in evidence throughout extended versions of his singles including Let Love Rule. There was something of a hippyish, throwback feel to his performance which included latest single 5 More Days til Summer, which fitted in perfectly with his repertoire of hits. He left the crowd on a high with 1993’s classic Are You Gonna Go My Way. A great start to the day. 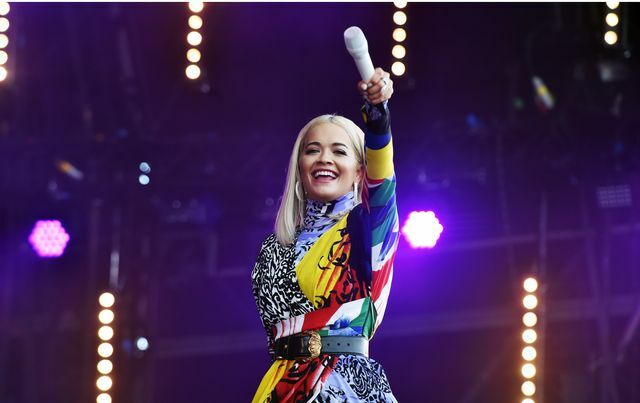 Next up is perhaps an act that’s more used to appearing at Radio 1 events and one of two acts on the line up that hasn’t had a hit in the 90s, step forward Rita Ora. She arrived on stage with six dancers dressed in black shorts and shiny sports sunglasses looking like they’ve come for a spin class. 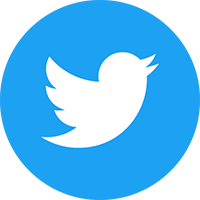 They had to bring their energy as they wind around Rita who is wearing a very bright short dress and has peroxide blond shoulder length hair. Rita opens her set with one of her biggest hits, Your Song, and it’s obvious that particularly the younger members of the crowd are here for Rita. When she reaches no.1 I Will Never Let You Down she promises to get the crowd singing along and easily succeeds. For Lonely Together she pays tribute to Avicii and then seemingly tells the audience it’s ok if you’re too ashamed to admit to liking 50 Shades of Grey; a film in which she stars and had a hit duet with Liam Payne. Today though it’s just a solo version of that hit that she performs, finishing her set with the uplifting Anywhere which gets the crowd bouncing. Third act to the stage is the leftfield Band Of Love. Jo Whiley describes them as folk music under a glitter ball and she couldn’t have gotten it any better. It’s an eclectic bunch of musicians and singers complete with guitar, violins, accordian and a whole host of instruments, I probably can’t even name. They start with a frenzied harmonica piece before launching into their version of Sister Sledge’s We Are Family. They are a little awkward as they take turns talking to the crowd throughout their set, with one member declaring they are like Marmite and you’ll either love or hate them. They work through a number of interesting covers including the Bee Gees Night Fever and George Benson’s Gimme The Night, both of which have the crowd swaying merrily along. 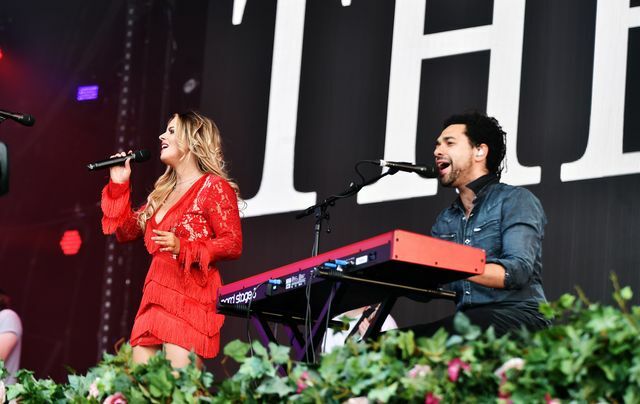 The Shires gallantly stood in for Carrie Underwood who had to pull out due to illness. No strangers to Radio 2 playlists or Hyde Park (they told the crowd they first played this same event in 2015) they got the crowd going with Echo and Guilty from their current album Accidentally on Purpose, bringing the country vibe for the perfect mid-afternoon chill out. Ben eased between guitar and piano throughout the set and was on fine vocal form as was Crissie, who looked gorgeous in a bright red, fringed dress and white boots. The pair split the crowd to get them helping with backing vocals and also had them creating a giant Mexican wave across the whole park. A sight to behold! 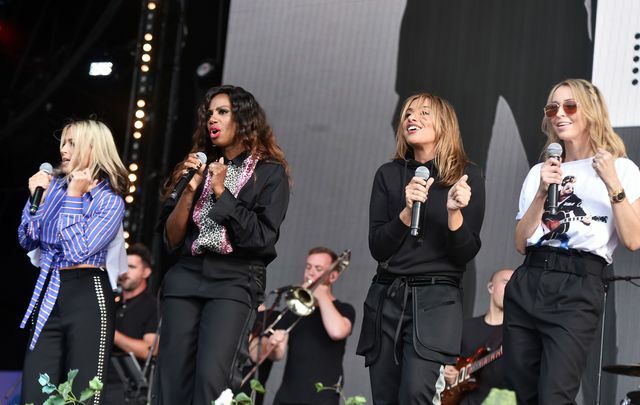 All Saints returned with their 5th studio album this summer which saw them reunite with Pure Shores collaborator William Orbit. They entered the stage in marching formation before Shaznay kicked off with an acapella line or two of their debut hit I Know Where It’s At before the beat kicked in and the foursome were in full swing with harmonies, co-ordinated dance moves and even a bit of saxophone (sounded suspiciously like Hear the Drummer Get Wicked but alas no full mash up). They treated the audience to new single After All followed by a slight mis-step with a strange Jay-Z/Missy interlude that was abruptly interupted by Nat singing the famous ‘a few questions that i need to know’ from their classic Never Ever. The girls then peformed Love Lasts Forever, complete with hand actions that resembled the Baby Shark dance a little. The girls looked like they were having so much fun playing both new and old tracks to the masses gathered in Hyde Park. 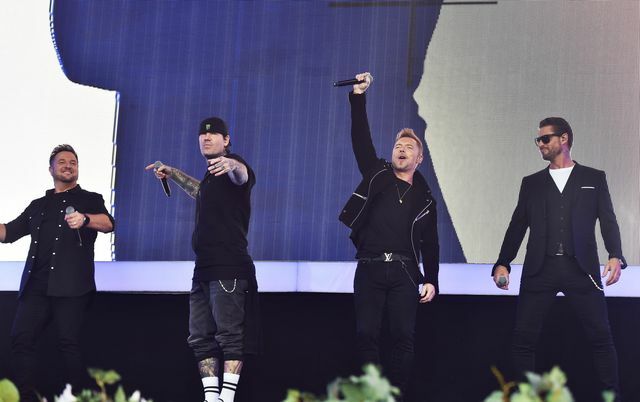 Next to the stage was Boyzone who are back together for one last album and tour. The die hard Boyzone fans weren’t the only ones who could be heard singing along to a hit heavy set. Opening with Picture of You, Ronan’s unmistakable power vocals, with that distinct Irish lilt, filled the entire park, if not central London. We were pleasantly surprised at how the other three members held their own vocally with Keith taking on singing duty alongside Ronan on the opening track. Things were slowed down for a more acoustic version of their Tracy Chapman cover Baby Can I Hold You Tonight with Ronan’s vocal soaring once more. Mikey led the band on their first no.1 single, Words, which was quickly followed by another no.1, Going Gets Tough which saw Keith and Shane joining the vocal responsibility whilst all four members did a bit of a boxercise class dance routine. New single, Because came next. The Ed Sheeran co-write is a mid tempo number and Ronan couldn’t quite believe he’d managed to get Ed to work on it with him. Live, it felt strangely familiar and at home among their canon of hits. For No Matter What they brought to the stage singer Jo Garland to help with the Lloyd-Webber penned track and finished their set with Different Beat. I would say this set was the audiences not-so-guilty pleasure! Things get a whole lot rockier as Manic Street Preachers turn up the guitar angst with a raft of hits. Opening with Motorcycle Emptiness and moving through tracks that span their near 30 years of music making, there’s some gentle headbanging going on in certain pockets of the crowd. Backed by the Red Indian image from their current album Resistance is Futile, the band sound better than on record as they perform You Stole the Sun from my Heart, Everyting Must Go, Your Love Alone, You Love Us and If You Tolerate This. It wasn’t just their greatest hits though, new single People Give In also received rapturous cheers from the crowd. 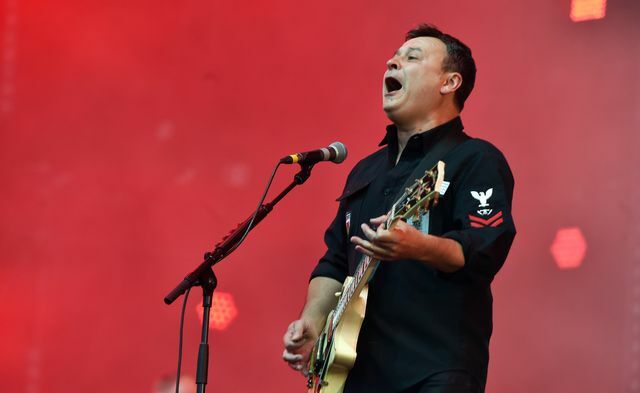 James Dean Bradfield reminded the crowd of the band’s connection to tonight’s headliner (they co-wrote tracks with Kylie on her Impossible Princess album and she’s popped up for a cameo at their live shows too) and hinted that they’d love to do something with Kylie again soon. This left both Kylie and Manics fans hoping for a rendition of either Some Kind of Bliss or Little Baby Nothing but alas it didn’t happen. The band ended their brilliant set with one of their biggest tracks A Design For Life. As the night sky darkened, the time for the headline act had arrived and the excitement rippling through the crowd was palpable. With another no.1 album, Golden, under her belt and a new country twang I was eager to see what songs Kylie would choose for tonight’s set and how she would blend her dance pop with the country influence. The glowing red heart in the centre of the stage started to flash as dancers took to the stage and Kylie appeared in a sort of pink silky poncho style dress to sing the title track to Golden. The crowd watched on as the cowboy style (pun intended) dancers maneuvered themselves from very high chairs and even Kylie partook in a little choreography too. I had a little gasp as she fiddled with her dress, worried about a minor Madonna cape incident but luckily Kylie’s poncho top came off and revealed a summery dress underneath as she performed one of her no.1 hits Spinning Around. Immediately following this song, Kylie informed us (due to some technical issue) she’d been told to fill for 20 secs and decided to ask the crowd for requests. She gave an unaccompanied burst of Got to be Certain, then Step Back In Time and even a little je ne sais pas, j-j-j-je ne sais pas much to the delight of the crowd. She looked so happy and elated to be here in Hyde Park once more and as the issue was resolved and the music kicked in she blasted through a succession of her hits including In Your Eyes, On A Night Like This and a more guitar-laden version of her biggest hit Can’t get you out of my Head. Stop Me From Falling and Dancing from her new album were also present but it was probably when she got a choir to help her sing Especially for You that things got really interesting. When it got to the middle 8 Kylie suddenly announced she had no one to dance with until from side of the stage runs Jason Donovan. She leaps into his arms and it’s like i’m back in 1988! Clearly this was a last minute thing as Jason doesn’t have a mic but the pair share Kylie’s as they sing the chorus together…togeeether. 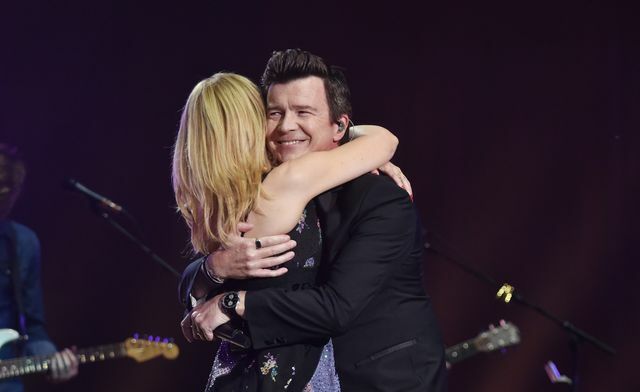 Later, Kylie sings I Should Be So Lucky, telling the crowd it reminds her of another 80s classic before veering off in to Never Gonna Give You Up before Rick Astley joins the stage and the pair look like a couple of old friends at karaoke as they sing the track together. Kylie asks Rick to join her for another song and they perform Kids which sounds fantastic with Rick’s powerful, soul voice. Kylie’s given Hyde Park a night to remember and a big step back in time with classic hits from her 30 year career. She leaves the stage with a dedication to us all with All The Lovers. Congrats to Radio 2 for another great festival in a day! Vote for your Kylie Tour and read what we are hoping for from her upcoming Golden Tour.